Reynolds and Associates was proud to be part of the 2017 Heights Chamber Gala held Friday, September 29 at the historic Houston Heights Theater. One of the highlights of my professional career was receiving the President’s Award from the Chamber. I was not aware I would be receiving this honor prior to the gala, so it was incredibly humbling to hear my name announced. What also made the night special is that I have attended events at the Heights Theater since childhood. Plus, our very own Certified QuickBooks ProAdvisor Brooke Brown was nominated for this year’s Rising Star Award. Being at this historic venue for such an important event made it feel as though we were enlivening an important piece of Houston’s history. 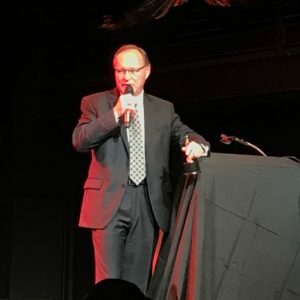 For this year’s gala, the Heights Chamber presented “A Night at the Oscars.” This black tie event was sold out with the entire Reynolds and Associates team in attendance. We were proud to be a Gold Sponsor for the event benefiting the Heights Chamber, an organization that’s near and dear to our hearts. There was also a silent auction and several live auction items raising money to develop future leaders. The gala highlighted the importance of being a Chamber member to build a sense of community within the Greater Heights Houston area. Throughout the year, the Chamber provides opportunities for networking, luncheons, sponsorships, and community awareness. The gala is a natural extension of the efforts from everyone involved continuing the legacy of an important local organization. Beyond receiving the President’s Award, the presentation and festivities captured how rewarding it is to see businesses give back to their community. Festivities included performances by the Houston Show Choir, the Houston Horizon Reunion Quartet, and other local performing groups. But, that was not at all! For the first time, the gala included a rooftop after-party at the historic Harold’s Restaurant on 19th Street. Experiencing more history and seeing the community come together was special to me. Plus, the Reynolds and Associates team celebrated another successful season delivering professional accounting services to clients in the Greater Houston area and beyond. We would love for you to be part of our journey. Find out how we can serve your accounting needs and perhaps we will see you at next year’s Heights Chamber Gala.